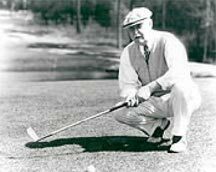 Donald Ross, continues to be an integral, if not the primary, influence on my design philosophy. In 1986 when I began my professional career in golf course architecture my father and I immediately visited Pinehurst. I studied Pinehurst Number 2, Mid Pines and Pine Needles, all great Ross courses. Studying Pinehurst Number 2, the golf course Ross continuously refined over the years, was nothing short of fascinating and inspirational. Realizing that Pinehurst Number 2 evolved from sand greens to the wonderful green complexes that continue to challenge golfers today, illustrated to me Ross’s ability to create a great golf course where the putting green complexes are the heart and soul of the course. The routing and strategic components of all three courses relate very well to the topography. They also continually challenge players of all skill levels with a variety of strategic options. I traveled to northern Scotland to study the great links golf courses that influenced Donald Ross. Many of the courses were designed by Old Tom Morris, the great mentor of of Ross. The routing of the golf courses through the sand dunes of the linksland, the natural green sites, the penal bunkers and the integration of land forms into the strategy of the golf holes had a great impact on my appreciation of classic golf architecture, while refining my design philosophy. I spent most of my time at Royal Dornoch, Ross’s Scottish home. Studying the plateau greens that so influenced Ross, I began to better understand his philosophy of green design that provides many different possibilities for recovery shots. Also apparent was Ross’s philosophy of how an approach shot played at a particular angle into a putting green complex would result in a far superior result than other angles, thereby giving tee shot placement the utmost importance. I have set of original blueprints of the Hill Course at French Lick that my father gave to me many years ago. To this day, I still study those plans. The Hill Course also has an important place in the history of Indiana golf as it was there that Walter Hagen won the PGA Championship 2 up over J.M. Barnes in 1924. It always is a special round when playing the Hill Course that Ross designed and where the legendary Hagen won a major championship. I’ve always considered the original design of Seminole Golf Club to be one of the best strategic designs of classic golf course architecture. Before designing Purgatory Golf Club (located in Noblesville, Indiana), I contacted Tufts Archives to obtain a set of copies of the design plans for Seminole. Ross’s use of bunkering to create different routes of play for players of all skill levels and to define the golf hole’s strategy is fantastic. His greenside bunkering melds well with the strategy created by the fairway bunkering to create a cohesive design. I studied his strategic routing and his green designs as an inspiration for the design of the strategic elements and geometry of Purgatory Golf Club. One of my most memorable rounds of golf was a solo early morning round at The Orchards Golf Club near Northampton, Massachusetts. It is a nearly untouched Donald Ross design. The shotmaking requirements throughout the round are flawless. The original nine holes were built in 1922 and nine were added in 1931. I have the greatest respect and reverence for Donald Ross and his golf course architecture. His golf courses will continue to be a source of inspiration for my designs for the rest of my career. In fact, I now draw my plans with the same format that Ross (and Bill Diddel) used.